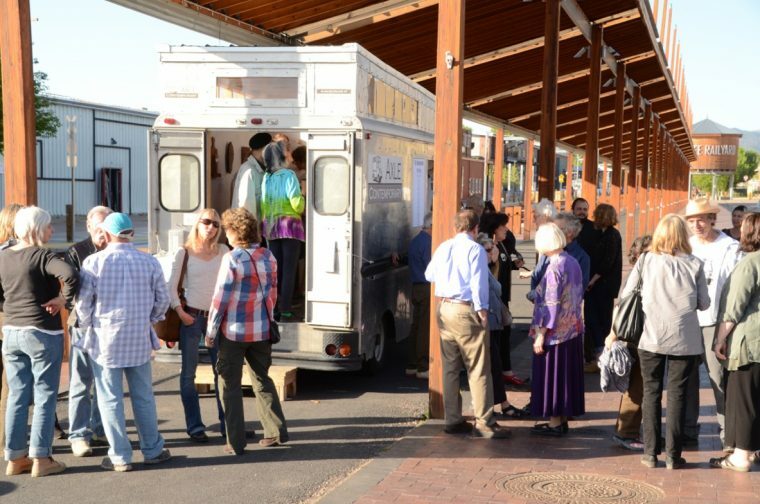 Kindle loves this project because... Axle shows how something seemingly small, like a transformed bread truck, can have a huge impact on a community. The stories that Matthew and Jerry (Axle co-founders and co-curators) share here about how they began and how they work together further highlights the magic that can happen with creative collaboration. The Axle crew is committed to their work as social practice artists and curators and their imaginative and accessible projects are a testament to that. What were the initial sparks that got Axle started? Matthew: A little over 6 years ago there was a beautiful old International Harvester flatbed truck for sale on the side of the highway by my house. I thought it was incredible and I wanted it. But, I had no use for it and I’m not a gearhead so I didn’t know how to fix it. One idea I had was to park it at my house as a sculpture because it was so great looking. Soon after that, I was working on series of photo portraits of artists in their studios and I was shooting photos of Jerry working. While I took his portrait I began telling him about the truck. Jerry then told me about his mobile camper that he was thinking about using as a space to show art. It wasn’t planful. We weren’t think about opening a gallery. It all just grew organically out of those ideas. To me, there’s a beauty in coming up with strange and crazy ideas that make no sense and then choose to do them once all the the reasonable ideas have already been done. Jerry: When this idea took off, it took off fast! I went to look at the truck that Matthew had seen and it was beautiful! It was totally cool. But, a 25 foot flatbed dragged behind it was nuts. How were we going to drive that around? The truck was too daunting. We thought it would be good to create a really experimental gallery. A place where you bring the art of people to the people. When you create something that has limitations built in it forces you to work within those limitations and create something really interesting. We looked on Craigslist at airport shuttle buses, old Winnebago’s, old school buses…etc. None of these really worked for our ultimate mission. We saw someone in Colorado Springs who had an old Wonder Bread truck that he had turned into a construction truck. (It just so happens that this same guy was also the number one Elvis impersonator in the 80’s.) This is the history of our truck. And this Wonder Bread truck is the one we went with. It was inviting for people to come in. When we saw this shiny, beautiful, big old step van, we fell in love. It was perfect! Matthew: Jerry and I have been working together for six years now as curators and business partners. We’re so happy at how well we work together. It’s non-hierarchical. I haven’t had that ongoing relationship in any work situation. It’s really gratifying and we have a lot of luck. So much of our work as artists is solitary work, and there’s something great about that. But working with Axle is a work of social practice art. It’s also a collaborative thing between us and the hundreds of artists that have contributed and people that visit. We are bringing solo practices into open and collaborative spaces where all are welcome. There’s something really wonderful about that. 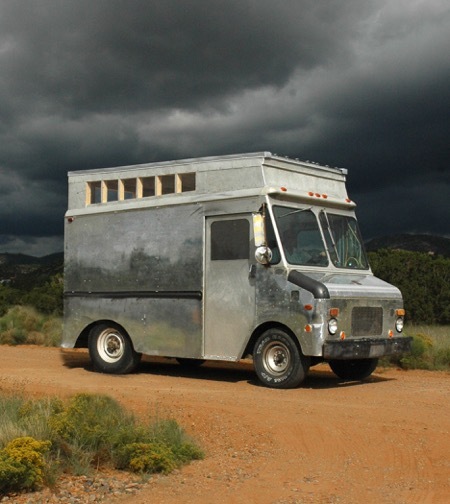 Did you have a favourite story from your work with the mobile gallery? Jerry: We did a photo project where people would bring an object that resonated with them to the gallery. We were in Albuquerque near a place that was serving homeless people and we would take a photo of a person with their object and give a copy of the photo to them. We gave one man his picture and he went outside and stared at that photo of himself for five minutes, minimum. It was such a powerful moment for me to see that. Matthew: Working with art on the streets where so many of these people had never had a formal portrait of themselves taken, or hadn’t in decades, the engagement of that day was beautiful. There’s so many moments like that and they are so unexpected. Yesterday, a guy came in to the gallery who lives in France and I used to live there so I got to spend 30 minutes talking to him in French. There are all sorts of opportunities which are deep and meaningful and some which are light and easy. It’s the combination of this that excites me. What was your experience of receiving a Flow Fund from Erika Wanenmacher? Matthew: It felt like such an honour coming from her. We respect her work and we’ve shown her work many times. We’ve known and loved her work for years, even long before Axle started. Her sense of art is something more than a pretty object, her witch practice – the physical meaning and objects of power has so much meaning to it. Jerry: We love her work. Her honouring us by nominating us was sweet and incredible. The honour is as meaningful as the money. She’s one of my favourite artists and to be nominated by someone I respect that much makes me feel good. She also understands the way we operate our gallery, that our decisions aren’t made on commercial concerns. This can be a real struggle for us and looking for funding can be a challenge. She sees that what we do serves the community. The money from the Flow Fund makes a huge difference. It will go into our general operating funds: to pay for gas, oil, etc. as we go out to the Navajo nation. It will also help us buy ink and paper, and some of it goes to each of us to remunerate us a little bit so we can keep going this. Rose Eason from GallupArts. Rose has recently taken the role of executive director of GallupArts, the local non-profit organization promoting the arts in Gallup, New Mexico. The organization is grassroots and like Axle, runs on a shoestring budget. We recently travelled to Gallup and surrounding areas for our E Pluribus Unum: Dinétah photo project. From our first introduction, Rose has shown unusual enthusiasm, intelligence and sensitivity and proved invaluable to helping us reach into a community where we had no contacts. Because of her knowledge of the community of Gallup, we experienced, over the course of a week, a remarkable amount of enthusiasm and appreciation for our presence. We also have deepened our understanding of Gallup’s incredible history and hopes for its future. We believe that Rose has vision and abilities for creating vital arts programming to strengthen her community. Any funding directed by her will surely enrich and vitalize those around her. Her initiative could serve as a beacon to small communities throughout the US, and frankly we would like to see that happen. Matthew Chase-Daniel (né Chase) was born in Cambridge Massachusetts in 1965 and lived in New York City in the1960s. He later raised tadpoles, minnows, and a raccoon, learned to fall off a horse, and hunt morels, wild violets, and rainbow trout in the Berkshire Mountains. In the mid and late 1980s, Chase-Daniel spent three years at Sarah Lawrence College in Bronxville, New York (B.A. ), and three years in Paris, France, where he studied cultural anthropology, photography, and ethnographic film production (Ecole Pratique des Hautes Etudes & Sorbonne). Since 1989, he has lived in Santa Fe, New Mexico, renovating old houses, growing green chard, and making family and art. His photography and sculpture have been exhibited across the U.S. and in Europe. He is represented in Santa Monica, California by Craig Krull Gallery. He is the co-founder, co-owner, and co-curator of Axle Contemporary. Jerry Wellman’s paintings and drawings have been exhibited at the Brooklyn Museum of Art, Holly Solomon Gallery in New York City, Pierogi Gallery in Brooklyn, The Downey Museum, and The Orange County Center of Contemporary Art in California, The El Paso Museum of Art, and The Revolving Museum in Boston. His drawings were selected for a traveling show sponsored by the Smithsonian. Wellman has taught at the Pasadena College of Art and Design, CalArts, and New Mexico State University. He was formerly the head curator at Los Angeles Institute of Contemporary Art. He is the co-founder, co-director and co-curator of Axle Contemporary. The guys who run Axle are amazing and they came to mind for this Flow Fund immediately. They are so egalitarian in their work and they show so many kinds of work from writers, performers, and more. Their gallery is not just about featuring established artists and yet, they are on the front lines of art in the community. They travel all over the city and make themselves and the gallery space super accessible. What was the Flow Fund experience like for you? It was great! It was more money than I could give to people individually. In fact, when I got my Kindle check [for her Makers Muse Award in 2013] I gave a few people money, including Axle. I gave them some money to help repair their engine. It was pretty thrilling! Read Erika’s Nexus post here and check out her recent work here.